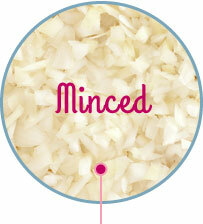 When properly, stored, cut and prepared, Sweetie Sweet onions offer a subtle taste and texture we’re sure you’ll love. Here are a few tips that will help you extend the shelf life of your onions and get the best results with the most flavor when storing, cutting and cooking sweet onions. HANDLING: In a recent survey, we found that consumers preferred to work with round onions in the kitchen. 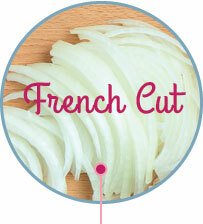 Nearly twice as many respondents said they prefer cutting and cooking with a round onion (46%) as a flat onion (25%). Which is great news, because all Sweetie Sweets are round. Also, there is more usable onion in a round onion, versus a flat onion, so they are a better overall value. Watch “How to Cut Onions Like a Pro” for cutting tips! Very finely chopped works great mixed with meat to tenderize, in Indian sauces to thicken without cream or stirred into a salsa. 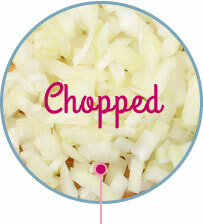 A larger chop than mince, this cut works well in soups, dips, egg dishes and with pasta. The most versatile, all-around cut of onion. Or “Frenched”, these slivers are good on salads, skewered and grilled or used for pickling. Best used on a sandwich or burger, pizza, or baked or fried into onion rings. Great cut for caramelizing onions. Do not store onions and potatoes together. Potatoes expel natural gasses that will cause onions to prematurely spoil. Keep onions and potatoes separated. Do not store whole onions in the refrigerator. Onions naturally develop a dry outer layer for protection. Dampness from refrigeration, along with the lack of air circulation, will cause onions to spoil more quickly. Sweet onions are delicate. Place them where they will not be jostled or moved around. Their high-water content makes them susceptible to nicks and bruising which will cause premature spoilage. If you are storing a few pounds of sweet onions at once, and want them out of the way, try placing them in a brown paper bag in a cool, dry spot like a pantry. Paper is more breathable then plastic. 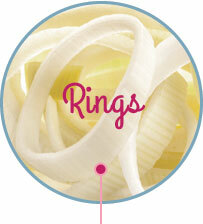 AVOID TEARS: Compared to yellow onions, sweet onions contain less tear-producing enzymes. In general, when you cut into an onion, you’re breaking open microscopic cells filled with enzymes that turn into gasses when they escape. Some people’s eyes react to the gasses by tearing. Other than a bit of discomfort, basically there’s no harm done by these natural gasses.